The first few years of our marriage, I was all over the place with our meal plans. 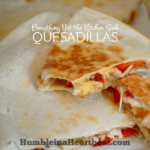 There were a few meals I would make over and over again because my husband loved them, but I loved exploring the kitchen and learning how to cook. So most nights, I was cooking something we had never had before. Hubby didn’t care for the variety too much, but I loved it. We were just two people then. Now we have two children and one on the way, so we have to be careful about how much money we spend on groceries. When our income increases, however, I would love to increase our grocery budget. Because we have a limited grocery budget right now (right around $300 for 4 people), I have had to learn what foods we like to eat as a family and keep ingredients on hand that will help me easily make those meals. PSST! 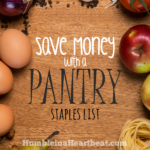 I have a great post about starting a pantry staples list if you would like to try this method out and save an estimated $125 on groceries each month! 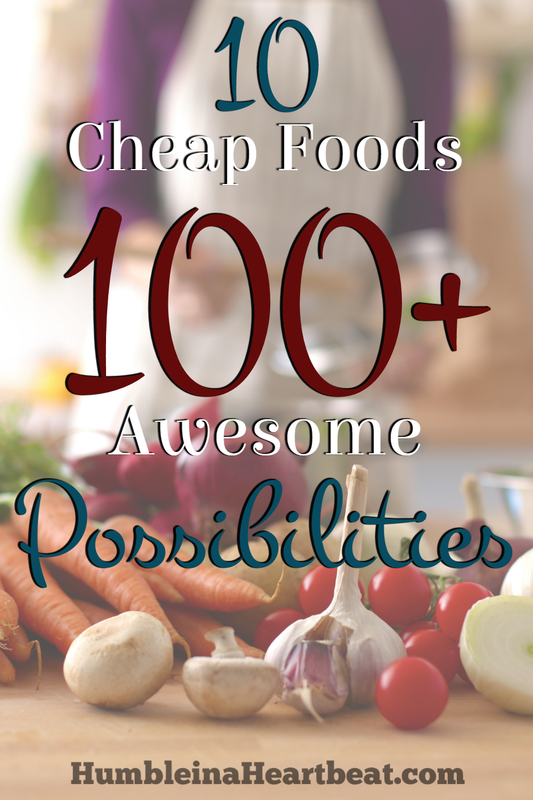 10 Cheap Foods. Over 100 Awesome Possibilities. Some foods are even better to have on hand than others because they can easily be turned into several different meals. No need for monotony! 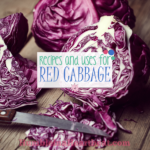 Below you will find 10 of the foods that I believe are imperative to a money-saving kitchen and can give your family plenty of nutrition and variety. I used to always just buy chicken legs and boneless, skinless chicken breast. At the time, I was squeamish about touching raw meat. Now, however, I buy whole chickens (most of the time). 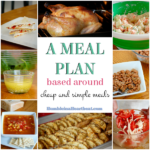 I can get 4-5 meals out of each one if I am intentional about what I will make before I cook it. It’s incredible the way you can stretch meat when you set your mind to it. If we have a whole chicken in our house, we can eat well for at least 4 days on just that. I get my whole chickens for 99 cents a pound (sometimes $1.19 a pound in the summer), so I end up spending less than $6 or $7 for each chicken. When I don’t plan ahead and we have nothing to eat in our house, we will occasionally buy a rotisserie chicken from the store. Ah! Shocking, I know! We spend the same amount of money as we do on a raw one, but the chicken is actually quite a bit smaller. We also tend to eat most of it for dinner that night, and the only thing I can really do to stretch that meat is put the carcass in the crockpot and make chicken stock. It definitely pays to plan ahead! 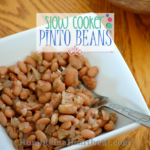 Ok, so I’m sure dried beans were not the ideal food you were hoping for on this list, but I can do so much with just dried pinto beans, that I know there are so many more ways to use the other varieties. Dried beans are so cheap that it’s essential to figure out a way to use these in your meals if you are on a tight budget. Nearly a year ago, we bought a 25 pound bag of pinto beans from Costco for about $16, and we still have a lot left! I’ll take 64 cents a pound, thank you very much! You won’t find meat this cheap, and that’s why you need to use beans to either stretch your meat or make a few vegetarian meals each week. If my husband was totally on board with beans, I’d probably use them a whole lot more than I already do! Here are a few ideas for what you can do with any variety of beans. There are so many more ideas on Pinterest and on the interwebs that you really have no excuses, ma’am! Holy, Hannah. Oats are amazing. It wasn’t until my oldest daughter was nearly a year old that my older sister introduced them to me. Of course I knew what oats were. I just had never done anything with them. I mean, outside of buying oatmeal packets, which are delicious, but really crappy for ya. The only thing I did with oats for a while was make oatmeal for my daughter. She loved it and now both of my girls eat it and love it. But I wanted to do more with them. So I made granola bars, baked oatmeal, smoothies, and more. It is really great what you can make with oats. You wanna know why? Because they are uber cheap! I can buy them in bulk at WinCo for 64 cents a pound. Try finding a packaged cereal that is that cheap! Now for the fun part, all the amazing meals/snacks/desserts you can make with them! Oat bars – never tried them but I just saw these on Pinterest and about died! Now you know you can do a lot more than just make boring, old oatmeal with oats! They can be turned into delicious snacks, breakfasts, desserts, and dinners! I actually go back and forth on potatoes. Sometimes I just don’t feel like using potatoes because to me they can be so boring and there are other vegetables that are way more nutritious. However, when it comes to lowering your grocery bill, potatoes can come to the rescue every time! The other day, we had half a bag of potatoes that were about to go bad, so my husband spent an hour peeling and cutting those potatoes and making french fries out of them. Homemade french fries are the best ever. I’m sure you already have your favorite ideas for using potatoes, but here are all the ideas I have come up with. I guarantee that you can use up all those potatoes before they go bad! When we run out of flour, the world stops turning and we have no idea what to do with ourselves! Speaking of…we only have about a cup or two left right now! I make bread every 3-4 days, and if we don’t have flour, that means we have to buy bread – bread that costs 4 times the amount that we pay to make at home! So, it is to our advantage to always have flour on hand. I used to buy flour at WinCo, but that was before we had a Costco membership. Now we can buy flour at Costco for just $6.39 (somewhere around that number) for 25 pounds! It keeps the cost of our bread way down, as well as anything else we make with flour. Of course, I’m sure you use flour on a daily, or at least weekly, basis, but here are all the ideas I could think of to make it go further on a tight budget. As long as I have tomato sauce, tomato paste, and diced tomatoes on hand, I can make just about any kind of sauce, soup, or pizza we like. If we had a garden full of tomatoes, I’m sure I’d love to learn how to make these tomato products from scratch, but, until then, I’ll be buying them in the cans! I usually buy these tomato products from Costco because they tend to be a bit cheaper, but I do have to buy a whole box at a time. It’s great, though, to always have these products waiting for me to use when I need them! One of the things I sometimes struggle with is using up a can of tomato paste, for example, before it goes bad. Well, you can simply freeze it (see my note below, though), but I would like to use it up in other ways. I just need to schedule more than one meal that requires that ingredient for the week and then I won’t waste any! Here are some delicious ideas for using canned tomato products. *By the way, you can freeze leftover tomato paste, tomato sauce, and even diced tomatoes. HOWEVER, if you do this, you may notice a stronger acidic taste. You can balance out the acidity of these tomato products by adding a bit of sugar to whatever you are making. This is just what I have learned from my Italian foodie brother-in-law. I’ve noticed that eggs are not as cheap as they once were, but they still seem to be pretty cheap. Each egg costs around 16 cents or less, and, in my book, that’s incredibly economical. If we have nothing in the house to eat except eggs, I can usually figure out something to make for breakfast, lunch, or dinner. Eggs are so versatile and can be cooked in so many ways that they should be on the menu at least once a week, if not more, especially when you want to cut back on meat and save some cash money. I’ll give you some obvious suggestions for using eggs in your meals, and then I’ll move onto some that you may have never thought of before. I put cheese on this list because when we don’t have it, I feel like our meals are a bit lackluster. Cheese livens things up! We like to keep mozzarella, colby jack, and parmesan cheese around for all our meals. I used to buy cheddar until I learned that we just don’t like that flavor as much as the others. Now, I know what you’re thinking. Cheese isn’t cheap! And you’d be correct. However, if you only buy it when it is on sale (or use coupons if that is one way you save on groceries), you can save a lot on something that is really a luxury. I like to buy my mozzarella at Costco because it is usually cheaper per pound than I can get it anywhere else. Although, sometimes you only have a small amount for groceries, and it might be better to just buy the smallest package even if you are actually spending more money. You know? Here are all the ways we use cheese in our meals as well as some others you might like to remember. Before last year, I would buy chicken stock in the cans. I had made chicken stock at home before, but it never seemed to turn out quite right. And then last year, I made it in the crockpot for the first time, and VOILA! It worked out much better! It made 8 cups of chicken stock from one chicken carcass and some leftover bones (and vegetables we had lying around). If you buy chicken stock, you know that 4 cups of chicken stock is 32 oz., which is usually about $2. How about 8 cups of chicken stock for maybe 25 cents?! It’s incredibly cheap to make your own chicken at home! I completely stopped buying chicken stock, and now I just make my own. I just store it in the freezer if we aren’t going to use it right away. Having your own chicken stock on hand is incredibly satisfying. Chicken stock can be used in so many different ways. Just look at the list of everything you can make with it! When a recipe calls for chicken broth, I always just use chicken stock in its place. The difference between broth and stock is that with broth, the chicken meat is cooked along with the water, veggies, and salt and pepper. Stock is made the same way but with just the bones and no meat. You can even freeze your stock in ice cubes if you use a lot of recipes that just call for a small amount of chicken stock here and there. And, hey, you can even make beef stock and vegetable stock if you want! The final pantry staple I believe is worth mentioning as one that should be in your frugal grocery budget is yogurt. It really depends on what kind of yogurt you buy whether or not it will be inexpensive, and you can even make your own as a cheaper alternative, but it is very versatile. I stick to buying just one brand of Greek yogurt and always get the honey kind. I’ve thought of getting vanilla, but, then, what if I didn’t like it?? You see, I am so set in my ways sometimes! So, as a I mentioned before, yogurt can be used in several different ways. Because I buy honey Greek yogurt over plain Greek yogurt, though, I am limiting the ways I can use it significantly. We only use our honey Greek yogurt for a small amount of things, but these are things we love to eat regularly. If I were to buy plain yogurt instead, these would be the possibilities. Because we rarely eat dessert in our house, having honey Greek yogurt around makes it easier to indulge a little so we don’t feel so deprived. Whew! We made it through! You have to know that there are so many other foods that I could have listed. These are just the top 10 for our family. You will notice that there were no fruits on the list, but that doesn’t mean we don’t eat them! We eat plenty of fruit every day for both breakfast and snack. I was considering replacing carrots with potatoes, but figured that most people probably already buy potatoes a lot more than they do carrots so they’d be more comfortable starting there! Last week when I started thinking about what foods we buy all the time and can’t live without, I decided to make a meal plan based mainly off these foods. It was a cinch for me! These foods really can turn into such simple meals that it’s imperative you at least consider buying them on a tight grocery budget. I encourage you to make a list of the main pantry staples you always need in your house. You will probably have a different list than I have. That’s great! If so, leave a comment with your top 10 foods and what you like to make with them so we can benefit from even more ideas! Wanna know what foods we actually spend more money on to add great flavor to our meals? Check out our favs! Great list, Charlee! I’d add pasta as one of my frugal pantry staples. I buy it when it goes on sale for $0.50 a pound. My husband’s not a pasta fan, but my son and I love it so will eat it when he’s working late! A quick pasta salad or plate of spaghetti or tuna salad…it’s great for a quick and frugal meal! Great suggestion, Kristen. Thanks! Since I don’t coupon, I don’t think I could buy pasta for that cheap, but even when it’s not on sale, it’s very economical. We love pasta, too! You can always make veggie stock from parts of veggies that you may normally toss or throw in the compost bin. 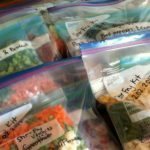 Just keep a bag in the freezer such as outer leaves of cabbage, celery, onion garlic,carrot, and other trimmings, just nothing rotten. Use herb stems, tough asparagus tips this way. Boil then simmer for at least an hr. Strain.Freeze. It must be great to live in the U.S.-whole chickens where I live (Canada) are $3-$4 per pound. I purchase the large cans of diced tomatoes at Costco and make a crockpot of marinara sauce which I freeze in meal sized portions. It is easy to add meat and tomato paste individually and spices for individual meals. It can be used for Chili, spaghetti, pizza sauce, etc.